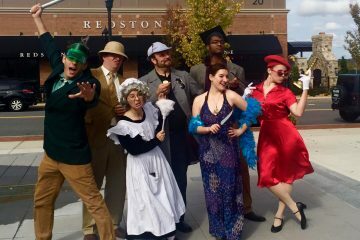 In addition to the wildly popular Clue Live series, you can join us for public or corporate mystery dinner experiences featuring the Mystery Cafe in Boston, Mansion Mysteries in Dedham and the Haunted Dinner Theater in Salem! Dinner and a Show is where Dinner meets Entertainment! Some of our featured events include the blindfolded Dining in the Dark, a journey back in time with Downton Abbey and the ever popular Finnegan’s Wake. Scavenger Hunts are wildly innovative, highly customizable and guaranteed fun! There is no better way to explore your city or town. Ask about joining Clue Live every Saturday in Boston this summer! Ready for an adventure of a lifetime? Head First Events have partnered with Adventure Activities USA to provide experiences that escape the daily grind of the office and bring you and/or your team outdoors! Book a public event or corporate / team event. Head First Events delivers the best in brainy, zany excitement. Give friends and family a memorable evening at one of our regularly-scheduled Boston area productions, or let us bring the fun to you – our customizable private events are legendary, and we stage them in cities across North America! DIVERSE EXPERIENCES FOR DIVERSE PEOPLE. Like the rest of the universe, our menu of activities is constantly evolving and being updated. Looking for things to do in Greater Boston? Our calendar for the latest public offerings and purchase tickets directly from our website, or book a custom event by calling us at 617-426-1999. We promise, your frontal lobe will thank you. Head First Events serves up a range of experiences designed to provide great times for groups who work together. See why Escape Rooms have become so popular. Enjoy one of our interactive murder mysteries, a hilarious evening of improv or even a full-on Irish Wake.